Primitivo is an Italian red grape that many wine drinkers recognize by its American counterpart Zinfandel, although the grape’s true origin is Croatia, where the grape is known as Crljenak Kaštelanski. Some have taken to calling Primitivo ZPC to include all three grape names as an acronym, even though it doesn’t exactly roll off the tongue the way the wine does. You’ll find my Top 10 Primitivo reviews and ratings here. 1. Primitivo has been grown in the heel of Italy, Puglia, since the 18th century, where it is now roughly the twelfth most planted grape variety. 3. Primitivo vines may ripen unevenly, but they can produce grapes high in sugar, often resulting in an average alcohol content of 15% or higher. 4. Primitivo can also be used for white wines and rosé. 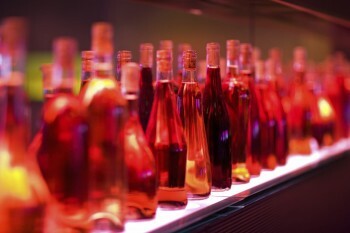 White Zinfandel is three times more popular than red Zinfandel in America. 5. The red wine typically displays rich, full-bodied, dark berry fruit aromas, and notes of pepper, raisins and black licorice, with a certain fruit sweetness to them. Primitivo pairs well with any dish that has a touch of sweetness in it, such as barbecued ribs and chicken wings. Steaks with a sweeter sauce or rub on them pair well with Primitivo as do hamburgers with relish, ketchup and other garnishes. Creamy cheeses like brie as well as spicy sweet coconut curry dishes also work as pairings for this wine. There are three Italian DOC regions approved for the growth of Primitivo: (1) Primitivo di Manduria, (2) Gioia del Colle Primitivo and (3) Falerno del Massico Primitivo. Researched by Lesley Quinn. When you join our wine community as a Paid Member, you’ll get access to all of my Primitivo wine reviews, which are updated weekly.